About a year ago my wife and I went to the movies to distract us from a difficult period in our lives. I had no way of knowing then that one day I would end up in a shoe shop in downtown Buenos Aires wearing a Carlos Gardel hat while strutting the tango snugly against various young Argentine women in tight clothes. And not just with my wife’s permission, but it was her brilliant idea in the first place. Nothing much of interest was playing that hot summer night at our local movie Cinemaplex. But we could both agree to settle on a movie that had a picture of Richard Gere and lovely Jennifer Lopez on the billboard. It was called Shall We Dance. I don’t like to dance but I don’t mind watching Mrs. (or is it Miss?) Lopez in tights. About half way through the movie I realized the degree of my wife’s enthrallment in Mr. Gere and the romanticized tale of Tango being presented in such a touching style. I was surprised when even I began to shed a tear at the end of the movie. Tango. This was all my lovely wife could speak about. She researched it, rented tapes, bought shoes, and of course she made me sign up for tango lessons. To my disappointment, my tango teacher was not as exotic as Jennifer and I soon lost interest after my 4th class because I didn’t manifest into Richard Gere. But my wife’s interest increased to the pitch of, “I want to go to Buenos Aires” on a daily basis. Finally I relented. A place I had never been, a language I had never spoken, and all because of a few dance steps I knew very little about. I rented an apartment in San Telmo for 2 weeks at more than a third less than the cost of a hotel. After we paid the landlord, I unpacked and took a stroll around the neighborhood looking for tango. The first thing I noticed was the age of the architecture. It reminded me of the French Quarter in New Orleans. Wrought iron balconies and super sized windows. I saw about 5 interesting restaurants on my lap around my block as well as a few extraordinary women. I did not identify any immediate signs of tango but I kept seeing an old picture of a man that looked to be somebody famous and debonair. The following day my wife and I went shopping for antiques and other unique items. We saw a sign for tango classes in a window and signed up for a 2 hour class at the price of $20 USD. The class was a living nightmare. Not only could we not understand what the teacher was explaining, we found the instructor to be very strict and rude. And the other students were taking it very seriously and laughed at us. It was a disaster and I swore I would never dance again. The next day, as we wondered the cobblestone streets of the tango district, I saw a tango nightclub that was painted exotic colors and I bought 2 tickets for a show and dinner. This dinner had courses the size of free samples at our hometown grocery. And once the show began, I kept wondering where the rest of the band was. Were they out back smoking? The whole cast included 6 people. About half way through the show, the spotlight turned on us at and the MC began asking us questions in Spanish. I turned red and my wife and I felt very embarrassed as the crowd around us laughed at a joke we did not get. Enough tango I told my wife. She suggested we take a city tour and found one in English for 20 pesos. This was her first good idea. I learned a lot that afternoon about Buenos Aires and the fascinating politics that could give most people whiplash. Our guide informed us about a Day Of Tango Tour that would guarantee a positive result and a deep look into the tango of Buenos Aires. I protested hard. My wife made a reservation anyway and at the last minute, I agreed to accompany her. Mostly due to fear about her dancing alone with Latin men. This tour started out in a great café in the city. Then we walked through the old tango district and I finally learned about what I had been looking at the whole time. 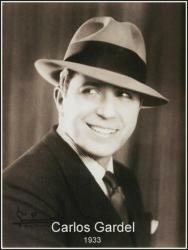 I learned who the man in the picture was, Carlos Gardel, and I discovered the history of the dance. Men created it and danced with each other in the beginning. They set the roles of women in a submissive stance thus making tango a manly dance. I could appreciate that. 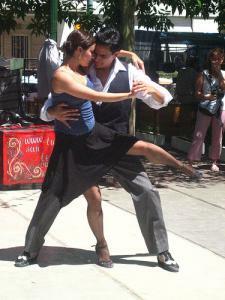 We went to several areas of the city before we got to our tango lesson. We purchased tango shoes handmade at 1/3 of the cost of those in the US. Our teacher was very sweet and patient with us and as we danced, others began to join us. Amazing women about 30 years younger than me found themselves in my arms, looking up to follow my interpretation of the classic music. I got to kiss each one on the cheek after a 3-minute jaunt around the dance floor. Somebody put a tango hat on my head and my wife began taking pictures of my giant grin and me. It ended all too soon with more kisses and hugs and laughs. And I did indeed find that I had manifested into Richard Gere. Perhaps even a little better looking. Well, the Day Of Tango Tour was paying off nicely. We went back to the hotel and changed into evening attire and were escorted to a historic restaurant where Carlos Gardel watched over us from his familiar pose in the black and white picture. We had the bife de chorizo and were glad we did. Then off to a real tango show. The kind I had expected to see. And after hearing about it all day, and learning the moves, I could really appreciate what I was witness to on the stage. The talent was incredible, and they were all so young. This time, the band was a proper band with a few accordion players who could really squeeze the thing into some expressive melodies. The music was great, the show was great, the day was fantastic and it all ended too soon. Byron Blade is a freelance writer in California. 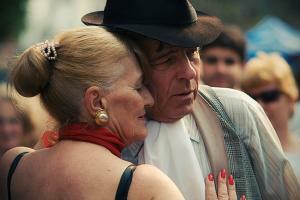 Visit Tango History Tours to learn more about the Buenos Aires Day Of Tango Tours. Article Source here.Thanks for the CC-licensed photos, San Telmo Tango, Carlitos, and GotaN City, to their respective photographers, including Suzanne Hitchen, the author of the second photograph. Download a walking tour of San Telmo on MP3. This page rendered in 0.061 seconds.